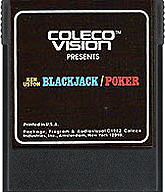 ColecoVision.dk presents: BlackJack / Poker © 1982 by: Coleco Industries. Initially © and Licenses: Coleco Industries, USA. Original Programmer and/or Designer: Unknown, Coleco Inc. 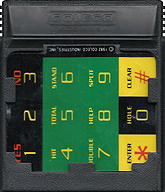 Original SFX Programmer: Coleco Inc.
ColecoVision Game Programmed by: Coleco Inc.
ColecoVision GFX Programmed by: Coleco Inc.
ColecoVision SFX Programmed by: Coleco Inc.
ColecoVision PCB Size, Type and Producent: 16kb., Coleco Inc., Coleco Inc.
ColecoVision Cartridge #, Casing and Producent: ICC 243901 / 4L1844, Standard Black U.S. or European Style, Coleco Inc.
ColecoVision Label Art and Design by: Coleco Inc.
ColecoVision Manual Layout and Design by: Coleco Inc.
ColecoVision Manual # and Manufacturer: 60.243901.71, 2L2226 CBS Electronics / 78132, Coleco Inc. U.S.A.
ColecoVision Box Art and Design by: Unknown, Coleco Inc.
ColecoVision Box # and Manufacturer: 60.243901.70, 3P3899, 74337R1 Holland / 76930 20431, Ivy Hill. U.S.A. This game contains 2 games: Blackjack and Poker. Ladies And Gentlemen, place your bets !. These two games bring home the high-stakes exciment of Las Vegas. In Blackjack, a fresh deck is opened, and "Max" the dealer distributes the cards for 1 to 4 players. Will you "Hit" or "Stand" ? Or, maybe you'd like to challenge "Max" to a showdown at 5-card stud Poker !. Do you hold the winning hand... Is's all in the cards !. High Score For The ColecoVision Version Of: Blackjack. ColecoVision Platform. ColecoVision Platform. ColecoVision Platform. High Score For The ColecoVision Version Of: Poker. ColecoVision.dk Game # 53, Blackjack / Poker is last updated: March 23, 2019. Please report errors regarding this ColecoVision game.